Dobinsons manufacture after market coil springs to restore the ride height with their improved design coils. In most cases, the coil is 20% - 40% stronger then the original OEM spring. This gives better load carrying capacity's for heavier loads and enhances road handling while also improving towing capacities. 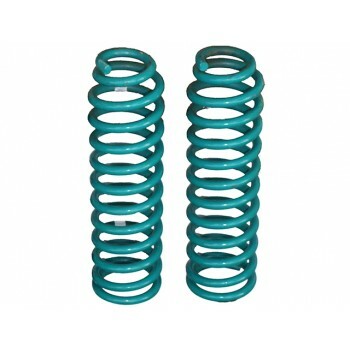 Dobinson springs also have in some cases a progressive rate design spring Suitable For some particular vehicle needs. The progressive rate spring design provides both an excellent ride unladen and a much needed increase in load in carrying capacity when required. This is achieved by making the pitch distance between the coils closer together at one end leaving less active coils working in the spring. This increases the rate tremendously, giving better load carrying capacity.